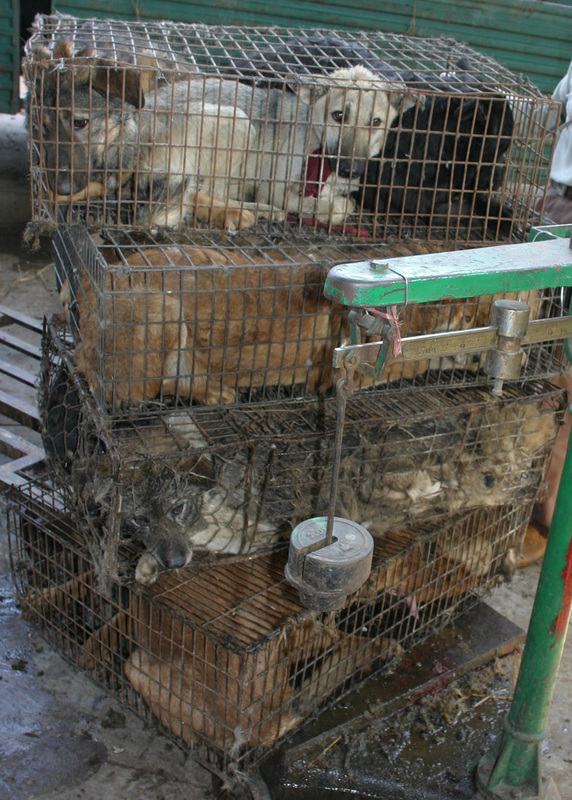 - 24 cats or 15 dogs for just one fur coat! Joining the protests around the world, Animal Friends as part of the national campaign "For Croatia without Fur" invites to a big and loud protest against the killing of animals for fashion and glamour and an impressive performance that will be staged as part of this protest. 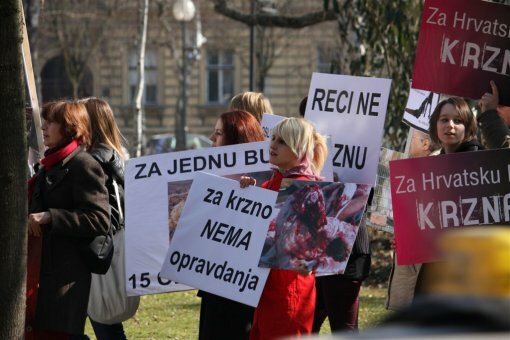 The theme of this year's protest is a ban on the import of dog and cat fur in Croatia according to the EU directives, with an accent on fur trim because more animals are tortured and killed for fur trim than for fur coats. Many people from all over Croatia are expected at the protest, but also supporters from Slovenia, Bosnia and Herzegovina, Germany, Serbia, Austria, and Montenegro. Protest march starts on Saturday, February 28, at 11 A.M. from King Tomislav Square in Zagreb. Hundreds of loud participants "armed" with posters will stop at 12 noon on Ban Jelacic Square, where undressed and caged Animal Friends activists will carry out their beforehand prepared performance. 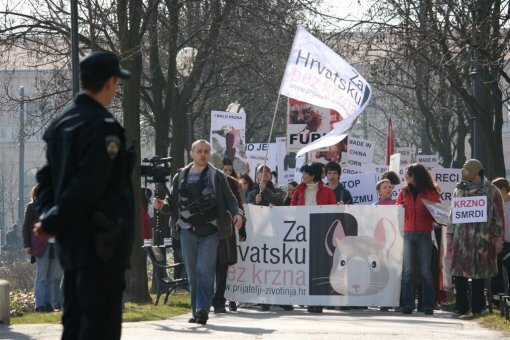 At 12 noon on the main Zagreb square Luka Nizetic, an advocate of the project "Say No to Fur Now and Forever," some members of the band aid "I Love Animals," and others will give their support to this protest and the campaign "For Croatia without Fur." China is the world's largest exporter of fur, producing some of the cheapest fur on the market, which is commonly sold as fur-trim on coats, gloves, purses, toys and trinkets. It is estimated that China kills more than 17 million animals a year because of their fur. 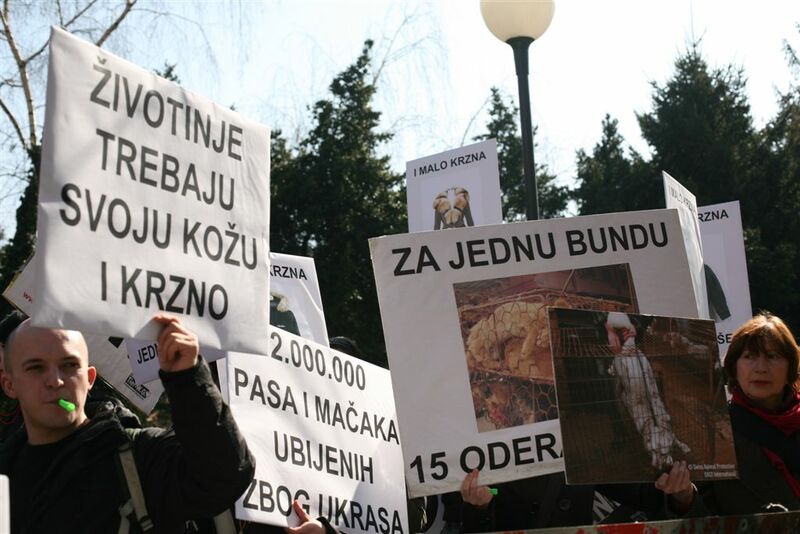 Raccoon dogs, foxes, minks, rabbits and even domestic dogs and cats are among the animals slaughtered for their fur, and they end up in Croatian stores as well. 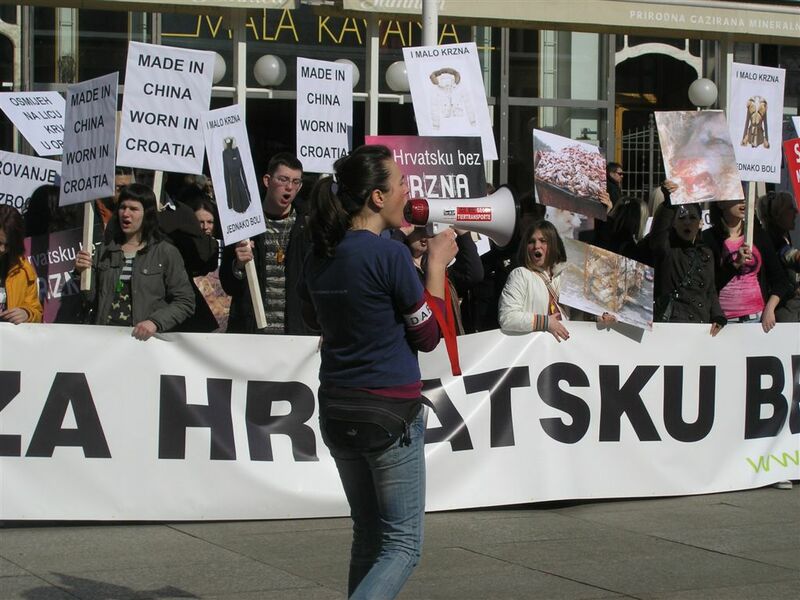 Animal Friends calls for the ban on import and sale of dog and cat fur in Croatia. 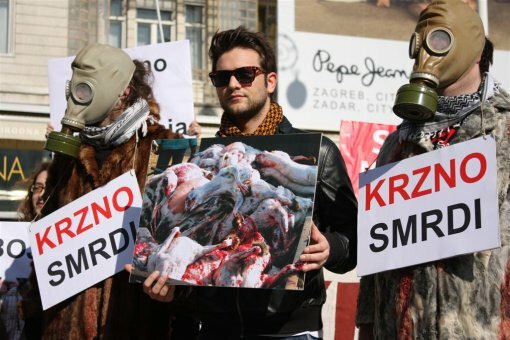 After the ban on fur farming and the ban on import of seal skin/fur and seal products, this would be another step towards building an ethically conscious Croatia without fur. - More than two million dogs and cats killed a year because of fur! Animals who are raised for their fur live in miserable conditions, confined to filthy, cramped wire cages. Disease, injury, and severe psychological distress are the norm on fur farms, and animals are killed by gassing, electrocution, strangulation, suffocation, poisoning with strychnine, breaking their necks, or inserting red hot iron rods into their anuses. Undercover investigations by Swiss Animal Protection/EAST International revealed the gruesome routine at Chinese fur markets, where workers club and beat animals, stomping on their heads and slamming them to the ground before cutting and then tearing their skin and fur from their bodies. Once skinned, the animals are tossed onto a heap of carcasses. However, these recently skinned animals continue to breathe, they blink their eyes and whimper for between five to ten minutes after their fur has been torn from their bodies and they pass away in pain. Today there is an abundance of high-quality ecological materials which are far better-looking and warmer than animal fur. Killing animals for clothing and luxury is therefore completely unjustifiable. The time has come when it is not enough to throw away clothing with animal fur but when one must condemn killing of animals for fur completely. Animal Friends sends this invitation to all the citizens and media representatives to come and support this public gathering on February 28, in order to send out a joint appeal for compassion and condemn fur as unacceptable and shameful. Mor photos from the anti-fur demo in Zagreb in the photo gallery.